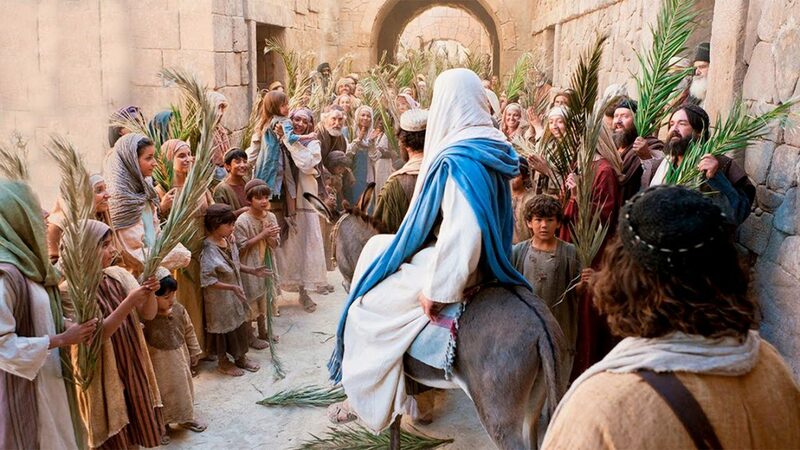 Palm Sunday is that Sunday before Easter that marks the beginning of Holy Week. It’s the day that we remember and celebrate the day Jesus entered into Jerusalem as Savior and King. As they approached Jerusalem and came to Bethphage on the Mount of Olives, Jesus sent two disciples, saying to them, “Go to the village ahead of you, and at once you will find a donkey tied there, with her colt by her. Untie them and bring them to me. If anyone says anything to you, say that the Lord needs them, and he will send them right away.” This took place to fulfill what was spoken through the prophet: “Say to Daughter Zion, ‘See, your king comes to you, gentle and riding on a donkey, and on a colt, the foal of a donkey.’ ” The disciples went and did as Jesus had instructed them. They brought the donkey and the colt and placed their cloaks on them for Jesus to sit on. A very large crowd spread their cloaks on the road, while others cut branches from the trees and spread them on the road. As we prepare to enter into Holy Week, may we constantly be reminded of its significance and value for our lives today. That very important day in history, when Jesus began His journey towards the cross. Yet maybe in the midst of busy lives, the pressures we’re struggling through, or in all of the upcoming thoughts about Easter, the real meaning of it may, even unintentionally, get missed.